Classic I Heart Button Badge. 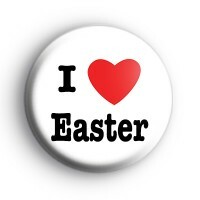 This 25mm badge has the slogan I Love (heart) Easter. Our Easter badges are fun to wear over the Easter holiday and they look super cute pinned to your coat. They're also nice for teachers to give out to your class or if you are organising an Easter party you could include them in your Easter party bags. We have so many fun Easter themed designs to pick from including classic Easter chicks, Easter Bunnies and lots of Easter slogans!